Police Use Tear Gas, Arrest 9 During Protests In St. Louis : The Two-Way The demonstrators gathered after police shot and killed an 18-year-old who officers said pointed a gun at them. Police said protesters threw bottles and bricks at them. A vacant house was set on fire. Firefighters attempt to put out a fire at an abandoned building with the protection of St. Louis City Police in St. Louis, on Thursday. Police used tear gas and arrested nine people during protests in St. Louis on Wednesday. Demonstrators gathered after police shot and killed an 18-year-old they say pointed a gun at them. Police said protesters threw bottles and bricks at them, so they deployed armored vehicles and teams of officers in riot gear. "The Rev. Renita Lamkin of St. Charles, who regularly attended protests in Ferguson, went to Page Avenue with several other clergy members Wednesday evening. She accused the police of engaging in an overly aggressive response. "Kayla Reed of the Organization for Black Struggle also said she believed officers were too aggressive toward a crowd 'that never was all that big.' She claimed officers gave no warning firing canisters of smoke and tear gas." Police defended their actions, saying they warned protesters that the gathering had been deemed an unlawful assembly. As The Associated Press reports, officers were serving a warrant at a home in that neighborhood Wednesday afternoon. They encountered two suspects. "The suspects were fleeing the home as [18-year-old Mansur] Ball-Bey, who was black, turned and pointed a handgun at the officers, who shot him," the AP says. Police say they found four guns and crack cocaine at the home. "Police said a 33-year-old white officer with seven years on the force and a 29-year-old white officer with nearly seven years experience fired their weapons after Ball-Bey pointed his gun at them. "A black male in his mid to late teens escaped and remains at large. Police said they recovered a 9-mm gun with 'an extended magazine' from Ball-Bey that had been reported as stolen in Rolla, Mo. They also recovered three other guns at the scene." Of course, these protests come at a time when tensions in the St. Louis area are running high. The last few weeks have been marked by events commemorating the shooting death of Michael Brown. The protests and clashes with police extended through the night. 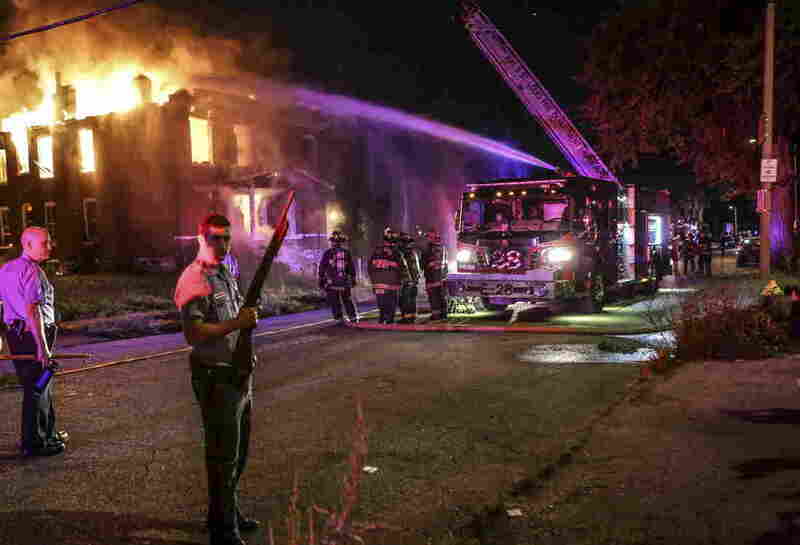 One vacant house was set on fire and the Post-Dispatch says police have received reports of businesses being set on fire.